"Good night to the rock 'n' roll era," croons Steve Malkmus on Pavement's new album, Crooked Rain, Crooked Rain. He's joining a long line of rockers who have proclaimed the "death of rock." On some level, of course, they're right: rock's always dying and getting reborn. The synthesizer-dance-pop explosion in the 80s, for instance, severely undermined the basics of rock 'n' roll--guitar, bass, and drums--and hip hop's beat-heavy ethic furthered the rock erosion. But the truth is, the electric guitar is in America's blood like apple pie or Chevrolets or guns, and if it occasionally gets shoved aside by other pop music trends, it generally elbows its way back. There's also a long tradition of introducing foreign elements into rock. Richie Valens brought in pinches of Tex-Mex, the Beatles noodled with sitars, and the Talking Heads employed African polyrhythms. But in the underground these days, a postmodern plundering of other musics is almost taken for granted. Dilettantish dabbling is practically mandatory; cultural borders are made to be breached. 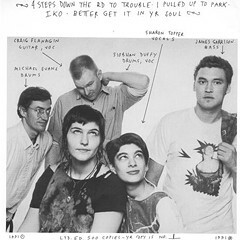 A New York outfit called God Is My Co-Pilot--the quartet of vocalist Sharon Topper, guitarist Craig Flanagin, bassist Alex Klein, and drummer Siobhan Duffy abetted by any number of loosely affiliated outsiders--is a rock band ashamed of its pedigree. In the most general sense GIMCP recalls the dull squawk first blared by New York's infamous "no wave" bands, early 80s combos like DNA, Mars, and the Contortions who slopped together intense, almost hysterical vocals, skittering, scratchy atonal guitar, thick, lumbering bass, and manic drum flailing. But GIMCP are reaching for more: they're attempting to make the music of the world their oyster. In New York's downtown Knitting Factory scene there's a current obsession with Yiddish culture. The phenomenal jazz clarinetist Don Byron recently dedicated a full album to comic klezmer clown (and Spike Jones alum) Mickey Katz; smartass saxophonist-composer John Zorn has organized "Radical Jewish Culture" concerts, leads a Yiddish-flavored jazz combo called Masada, and has written a serious piece about the Holocaust (Kristallnacht). GIMCP frequently hobnobs with the downtown avant-garde crowd--the band's abundant recordings (six albums and more than a dozen singles since 1990) are rife with guest spots by Zorn, Elliott Sharp, Anthony Coleman, and Jim Sauter, among others--so it stands to reason that klezmer would be included in its world outreach program. Add to that chunks of rough-hewn free jazz, various Eastern European folk genres, and a little country, and you've got quite a gumbo, but not like any stew ever cooked up in New Orleans. When GIMCP debuted in Chicago at the Czar Bar last month, presented under the auspices of Homocore, the combo seemed to be relying on a slim bag of tricks. The problem with genre hopping is that ambition is not enough; you gotta have chops, and by the time the set was through it was rather obvious that these musicians don't. Topper is an animated, gregarious, and engaging leader, but her shrill singing is rangeless and her melodies frequently devolve into children's-song mantras. Guitarist Flanagin's brittle, metallic shards and truncated phrasing were unimpressive and floundered when traveling outside standard rock vocabulary. The rhythm section--Duffy, Klein, and a second drummer--worked as a shambling, jarring force, but they were following the rather directionless lead of Topper and Flanagin. Punk rock asserted that you didn't have to play your instrument well to make good music. But there's a world of difference between bashing out a three-chord rocker and finessing "Hava Nagila." If God Is My Co-Pilot is going to kill rock 'n' roll, it had better sharpen its weapons.